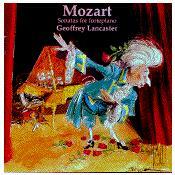 Three Mozart fortepiano sonatas played by Geoffrey Lancaster. Lancaster was a first prize winner at the Brugges Early Music Competition and has since outraged most of the early muscologists in Australia with his well-researched, forthright performances. His is a major talent and it is combined with formidable keyboard skills. This CD was the only Australian recording nominated for the 1993 ABC Record of the Year.